The most powerful Porsche 911 Turbo ever has arrived: the 911 Turbo S Exclusive Series. Porsche has managed to eke out just a bit more performance from the 911 Turbo S 3.8-liter turbocharged flat six with a new power kit that pumps power to 607 horsepower (up from 580), and torque now sits at 553 lb-ft. That power kit, among many other things, comes as standard on the new 911 Turbo S Exclusive Series. The extra bump in power means that this is the quickest and fastest 911 ever produced with a 0-60 time of 2.8 seconds and a top speed of 205 miles per hour. Because this car was fettled by Porsche Exclusive, it also manages to look unique—and quite good as well. As a matter of course, the Turbo S Exclusive Series is also fitted with PASM, Sport Chrono, rear-axle steering, and PDCC packages as standard. As you can see in the photos here, the 911 Turbo S Exclusive Series (911 TSES, as we call it) is finished in a gorgeous shade of Golden Yellow Metallic. Our favorite feature, the unique gold-accented split spoke 20-inch wheels, are standard and painted using an innovative laser system. Within those wheels hide black-painted carbon ceramic brake calipers with Golden Yellow Metallic "PORSCHE" script. The new TSES model is fitted with Porsche's Aerokit as standard as well, featuring a revised front fascia and a far-from-subtle wing on the rear decklid. Porsche also lightened this all-wheel-drive monster with a full bevvy of carbon fiber components, including (but not limited to) the roof, front trunk lid, and side skirts. Inside the car, 18-way adjustable sport seats come standard with perforated leather. The inner hide of the seat features a pair of Golden Yellow stripes, allowing some of that color to show through the perforations in the top layer. Similar Golden Yellow accents can be found dotted all over the interior, as every seam is stitched in the color and a pair of stripes across the Alcantara headliner. A similar color is created by weaving strands of fine copper thread through the interior's carbon fiber accents. There is a plate featuring the limited-edition number on the passenger's side, continuing the trend of exclusivity and rarity. 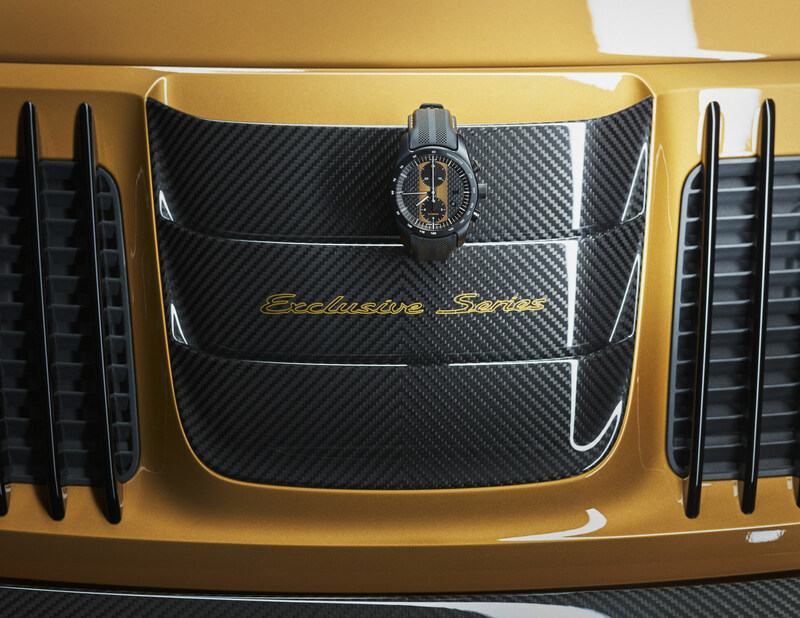 The door sills are illuminated with the words "Exclusive Series" and finished in carbon fiber. In only the finest Porsche fashion, this special edition car is also available with an optional color-matched Porsche Design chronograph and a color matched set of luggage. Suggested retail pricing for the 2018 911 Turbo S Exclusive Series Coupe will start at $257,500. The obnoxiously long-named "Porsche Design Chronograph 911 Turbo S Exclusive Series" watch will be optionally available at Porsche dealerships for those who buy the vehicle and can be ordered to the customer's requirements at the same time they order the vehicle. U.S. pricing for the watch has yet to be determined. 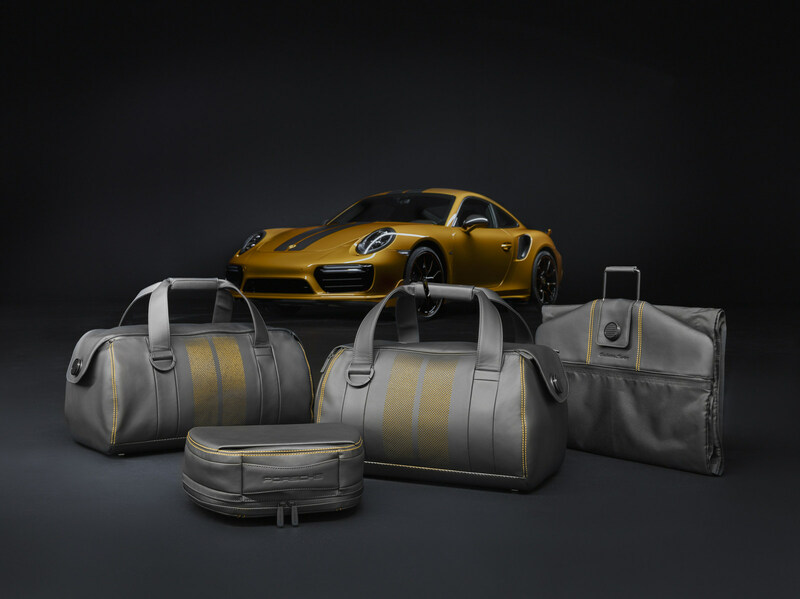 The five-piece luggage set costs $6,324, and is available to owners of the 911 Turbo S Exclusive Series Coupe in conjunction with delivery at the factory for customers who select European Delivery; it can also be ordered from the Porsche Tequipment range at any Porsche dealership. That's no way to treat a supercar—whether you're thinking about buying it or not. HG Motorsports & BBi Autosport team for a 997 Turbo Cab that is an absolute laugh. When hot rod artist Rob Ida builds his ideal 930, you can rest assured it's going look like it belongs in a museum and go like a rocket. Gemballa whacks another helpless Porsche with an ugly stick.